A Brazilian Jiu-Jitsu purple belt at our school, Manassas MMA, who may be called Billcelo Garnagle (to protect his privacy), posted the pic below on Redditt, which got more than 1 million views within 24 hours. The story was then picked up by Good Morning America (see below) where Clark Gracie then appeared on the show. "When there was nothing that made me feel good at all, Brazilian Jiu-Jitsu was the one sanctuary. It is pure. 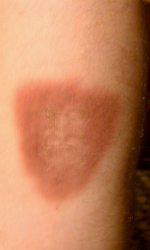 It lets you feel nothing." -Post by me in June, 2012, on the Manassas MMA / Dave Trader Jiu Jitsu Facebook page. 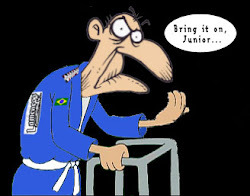 It has been over a year since I blogged on OldManJiuJitsu.com. As can be read in the Facebook post above, I have faced those dreaded or character building life scenarios of middle age. Father heart attack, take care of him for 4 months, in-home hospice, death, estate executor (thanks to O'Toole Law Office), left software company that I founded (C2Logix), started new search engine optimization (SEO) company (SeeYouSEO), got active in All Saints Catholic Church parish, 12 yo daughter sagas, etc. Doing BJJ over 40 has a lot of obstacles in the way of dedicating time to the sport. Regardless, it is pure, a sanctuary, and one of the best things that I have been involved with in life after 40. I have not had much time for the sport in the last 15 months, but it is still an important part of my life. I hope to return to blogging about BJJ and that colorless green ideas sleep furiously (nonsense), but wanted to return to this blog with a background about why I no blogged.